I reached the summit of Mount Shavano just before dawn. I’d been on the move for a little over 47 hours. This marked the ultimate peak of the Nolan’s 14 line in the north-to-south direction. I had one final descent remaining to wrap up the route. I sat on the summit, sheltering from the wind behind a low rock wall. The gusts had picked up significantly the past couple of hours, nearly knocking me off my feet on a few occasions. One such moment occurred as I tediously hopskotched my way over the talus from Tabeguache Peak, narrowly avoiding body slamming into the boulders. It was a crisp night and my slow forward progress prevented me from keeping a comfortable body temperature. I had put on my rain jacket to help with the breeze, but now felt too lazy to dig into my bag for my down pants and vest. What’s more, the proximity of the finish was at the forefront of my mind. I didn’t care much anymore about being tired, cold, or hungry with relief from all the discomfort being so palpably close. I thought to myself that perhaps if I ran fast enough I could reach Blank’s Cabin in under 48 hours. That had a nice ring to it–a validating symmetry of closing out the route neatly in two days. I sprung up to my feet and began darting back across the ridge I had just ascended. Gone were the aches and pains as I danced over the rocks with newfound zeal. As I reached the saddle between Mount Shavano and Tabeguache Peak quicker than expected, I exclaimed aloud, “You’re doing good, Joe. You’re doing good!” But then, as I peered down the drainage to the south, I couldn’t see the trail of deliverance that I had been visualizing for the past hour. Nothing looked familiar as I walked around desperately hoping for the path to appear. I gazed back up the ridge from where I’d just came, slowly beginning to discern the reality of my mistake. The final descent dropped directly east off the summit of Shavano, in the complete opposite direction from where I was moving. I’d have to retrace my steps back over the ridge for a second time. Suddenly, the wind seemed a little stronger, the air a little cooler. A wave of nausea came over me. I felt sick from the bars, the sugar water, the altitude. I stumbled back over the talus a different person, as if I’d been incapacitated by a change of perspective. I didn’t think I was doing well anymore. The unwavering positivity and focus I’d maintained over the past two days had shifted to a place of confusion and doubt. The sun had risen now, casting brilliant, warm light across the alpine tundra where a few bighorn sheep roamed. Hikers ascended the trail below, chatting lively as they enjoyed the final hundred feet to the summit of Mount Shavano. I didn’t share their enthusiasm as I bumbled down the path toward them, wrapped in thought. If the pursuit of a fast time was only a framework to push myself to the edge and learn something, why then was I so affected by this mishap? An hour or two more would have little impact on the richness of the experience of the past few days. Yet, all of my thoughts funneled toward an arbitrary number that I had decided would equate with fulfillment. Now, falling short of that expectation, the whole undertaking seemed overshadowed with failure. But then again, what if this was the moment I had hoped would arise and this was my opportunity to be truly confronted with myself? All of the challenges I had overcome to get to this point had been predictable and fallen into the preconceived notion of how I figured things would unfold. Wrestling over the frustration of those lost minutes, I realized that I was missing the point, that the true of value of the undertaking would only reveal itself if I let go of my expectations and surrendered fully to the experience. Have you ever been filled with dueling inner voices during a hard physical endeavor? If so, how did they eventually sort out in your psychology? During long runs or outdoor outings, have you ever let minor mishaps temporarily overshadow the depth, vividness, and overall success of the full-spectrum experience? Great write up, and great work out there. You always inspire me. Awesome write up. Those moments on reflection seem so comedic and part of what made an unforgettable adventure so fulfilling, but at the time I can only imagine the turmoil you must have put yourself through. In response to your questions, I constantly battle inner voices with running and try my best especially in the long runs to embrace the challenges they create. On occasions I have surrendered but when I have succeeded it has been when I thought less of a number as you describe it and about creating a moment in time that I will truly feel fulfilment from. It’s hard to tell yourself that at the time, the minor mishaps are the ones that can overwhelm what has been a perfect day. As with anything however they seem to be the moments you remember the most, not just because they were difficult, but because they were unforgettable and are the reason we enjoy being in nature’s unforgiving hand so much; not for the easy road, but for the moments we feel as Tim Ingold says, as though we are ‘stitched into the fabric of nature’. Keep on exploring Joe!! Beautiful message brother. Something we should all remember instead of fixing in on a number. Power on! Great article Joe. This reminds me of my only DNF during the Ouray 100. It was my first 100M, and come mile 60ish lower leg issues dramatically slowed my pace, yet I pushed on with a lot of pain. On the final climb up to Bridge of Heaven with some 8ish miles left I knew I wouldn’t meet the cutoff time. Even with the hope that I would finish and possibly secure a buckle, it wasn’t in the manner I wanted to finish. Stressed and upset I pulled the plug and headed back down to Ouray. 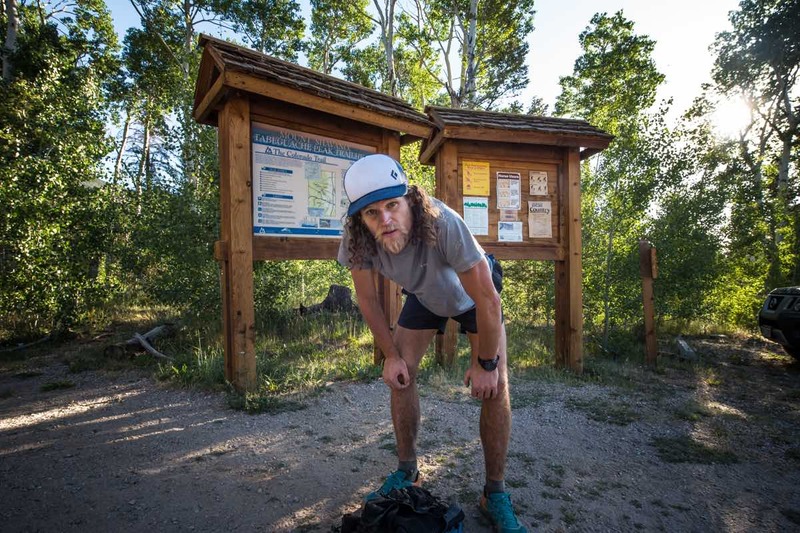 While psychologically defeated, my friends and crew let me know it was one of the most inspiring things to have been a part and I always reflect on the gorgeous miles I pushed through in the San Juans. Those couple of days remain my most cherished memory of my ultra running journey and that I was able to give it hell for 50 some hours.